Mostly classified in the "luxury" compact category, the Hexar is a large machine the luxury of which does not come from the technological complexity, but from simplicity and quality. One of its features is its incredible seven elements lens, with a 35mm focal length and a 2 aperture, which is extremely rare on a compact camera. From a stunning sharpness, it is the ideal tool for a very demanding photographer. 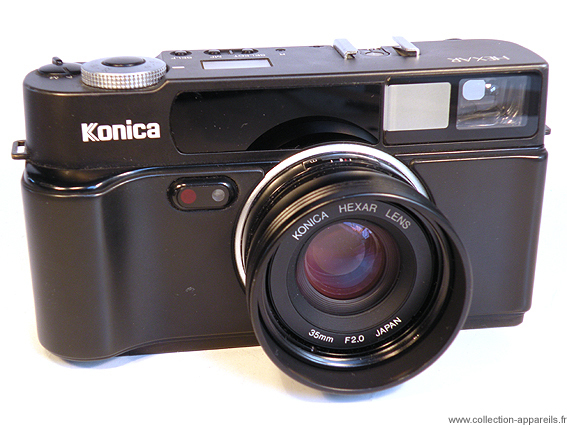 (Ironically, the name Hexar was previously reserved to rather low-end Konica lenses). The mode is autofocus. It is highly accurate with three measurement areas and 290 steps. This mode can be disabled, but the manual focus is done through two buttons (+/-), which despite their high precision make the operation unpleasant. The view finder is not reflex, but the framing is exactly what is pictured, whatever the distance of focus. The device has several exposure modes: program mode, automatic aperture priority or manual. There is an exposure memory. Unfortunately no aperture setting or speed is displayed in the viewfinder. In manual mode, a + and a - help with settings (semi-auto would be more accurate than manual). The transition from Program mode to Automatic or Manual mode is carried out by turning the main switch located near the shutter trigger button. The measurement of the exposure is very accurate. Set in the program mode or automatic mode using aperture priority, the measurement is central, with a coupling from IL0 to IL16. In manual mode, spot metering has an angle of 4 ° with a coupling from IL3 to IL18. In program mode, there is an opportunity to correct the exposure by plus or minus 2EV. Selecting the aperture is made by turning the serrated wheel that encircles the shutter button. To the left thereof is a liquid crystal screen which displays the camera settings. As little is displayed simultaneously, we must act on a select button to change the display to scan all of the parameters. Ergonomics is not its quality, and if there are few buttons, some hide several use possibilities. Reporting camera because of its focus and its aperture, the Hexar is silent, very silent when set to mode "silence". The reporter who wishes discretion will take advantage of it. As the film advance and rewinding are motorized, silence is obtained at the cost of slowing the advance of the film. The sensitivity adjustment is automatic, but the detection of the DX code can be overridden. The Hexar has no flash, but was sold with a flash. Technically perfect, this unit had one defect: its price .... about 5000 francs in 1992, and also a second: no battery, no camera!